With its single knob and switch, the PT999 Phase Tone is deceptively simple. Yet packed into this tiny blue box are a host of the most authentic 70’s era phasing effects available in a current production unit. Simply by adjusting the unit’s Rate control a wide variety of expressive phasing nuances can be coaxed from the Maxon PT999, all of them whisper quiet and amazingly transparent. The PT999’s minimalist circuit frees your guitar tone to be as smooth and responsive as it is when served up a la carte (or a la effect, as the case may be). 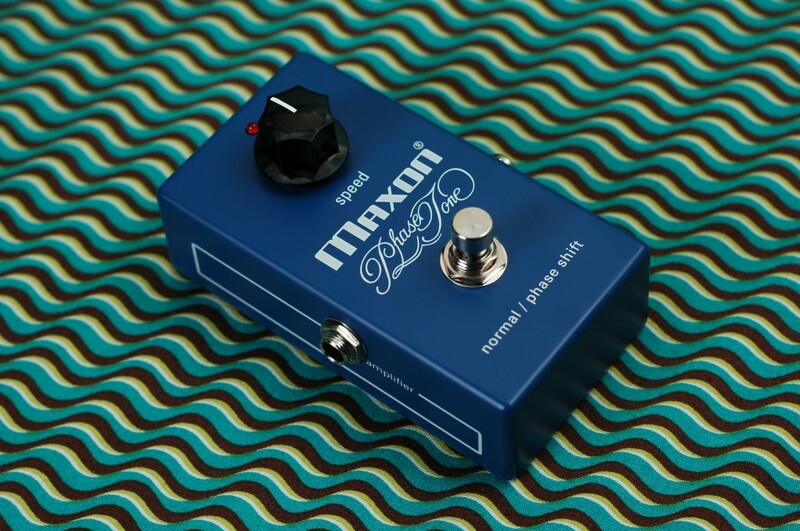 So what’s the secret behind the timeless tone of the Maxon PT999? Simple, the circuit used today is exactly the same as it was when first introduced in 1974. While many “reissue” effects on the market today are far from true to the original designs, Maxon has taken pains to keep the PT999 circuit unchanged for close to 30 years. The PT999’s four-stage phasing circuit offers 720 degrees of phasing sweep variable from .2 to 14 Hz (cycles per second). The PT999’s FET’s (Toshiba #2SK246) are carefully sorted and matched by hand to produce the smoothest phasing sweep possible with low noise. Unlike other phasers, the PT999 runs negative feedback of the signal to each phase-shifting FET for less distortion. Internal trimmers adjust center frequency and width of the phasing sweep (calibrated prior to market, we recommend adjustment of these trimmers be left to a qualified electronic technician). If you demand classic phase shifting effects without compromising your guitar’s signature tone, the PT999 Phase Tone has no equals.